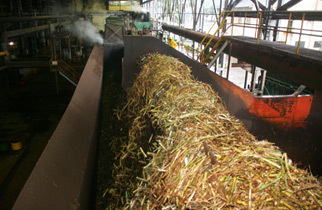 The sugarcane mills of Mato Grosso do Sul already account for a cumulative grinding of 9,787 million tons of sugarcane at beginning of period 2015/2016. The amount has been recorded in less than two months after starting the harvest of the crop, according to the monitoring cycle released by Biosul (Association of Mato Grosso do Sul Bioenergy Producers), on Thursday (11). The current harvest, which began in April should follow until January, 2016. With this number the forecast is growth of 15% in cane to the end. The comparison of the processed volume this partial of the harvest with the same period the previous season, 2014/2015, which was ,.476 million tons, the increase was 51,14%. The index that measures the quality of the raw material, the Renewable Total Sugars (ATR), also improved at the beginning of the harvest ahead the previous, rising 4,56%, to 115,58 kg per ton of cane to 120,85 kg per ton of cane. The president of Biosul, Roberto Hollanda, pointed out that this big difference in volume processed between the two cycles is the result more of a bad start harvesting the crop 2014/2015 than evolution of the 2015/2016 crop. “Still, we continue to forecast to grow 15% in sugarcane until the end of the harvest. On fortnight [second of May], the production could have been higher, if there wasn’t the excessive rainfall, “said Holland. The production mix in this “start” harvest is at 79% of the cane harvested being intended for ethanol processing and 21% for sugar. In part, the manufactured biofuel volume reached 55,.47 million liters, of which 427,58 million liters of hydrous and 124,9 million of anhydrous , while the food processing reached the 236,01 thousand tons.